Mesut Ozil has missed Arsenal’s last four matches and may be absent again when the Gunners host Huddersfield Town on Saturday. The 30-year-old playmaker is being treated for a back problem and manager Unai Emery has hinted that he could be passed fit on Friday if he comes through sessions with the club’s physiotherapist unscathed. The German had been on the training ground on Thursday “running and touching the ball”, Emery told a press conference. But even if Ozil is given the green light to return there are no guarantees that Emery will pick the club’s highest earner, even for the bench. Ozil’s omission from the starting line-up at Bournemouth on November 25 was the big reveal to a world that could not fail to notice. Emery’s explanation could hardly be misinterpreted either: Ozil was named on the bench — and left there for the entire game — at Bournemouth because his manager felt he could not deal with the “physicality and intensity” of the Gunners’ opponents. His absence mattered little as the Gunners’ unbeaten run simply carried on without him. The Gunners can take that to 21 matches against the Terriers with Ozil’s return to the side likely to be delayed till they play Qarabag in the Europa League next week. Wenger, in his final season, used the competition to keep fresh fringe men he had decided not to employ in the Premier League even though three of them — England duo Theo Walcott and Jack Wilshere plus Olivier Giroud of France — were internationals of experience and reputation. 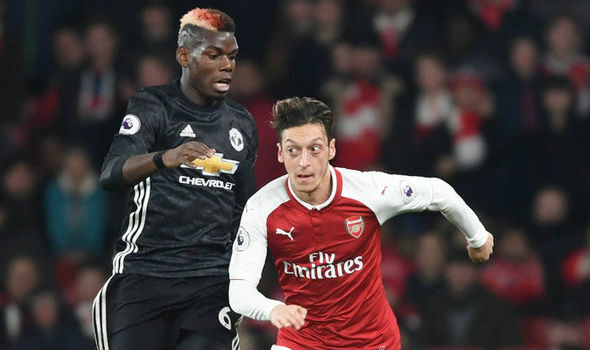 Ozil is not the only world class player to suddenly find themselves unable to get into the starting eleven, Paul Pogba, Romelu Lukaku and ex-Gunner Alexis Sanchez falling foul of the volatile Jose Mourinho at Manchester United. Ozil’s post-World Cup fall out with Germany cannot have helped either, coming at a time when every Arsenal player knew he had to impress the new man after years of inertia under Wenger. The player felt he was the victim of both racism and disrespect because of his Turkish roots, claiming “I am German when we win, but I am an immigrant when we lose”.